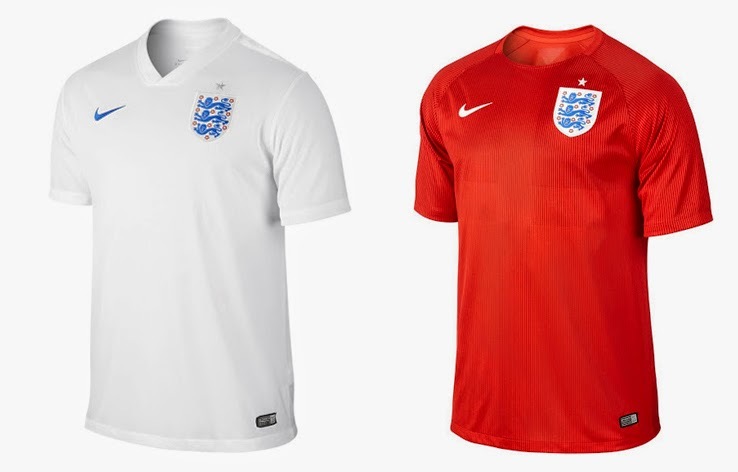 With England's kit, Nike hasn't impressed me once again. Both the first and alternate shirts are quite boring. I do like the fact that the design of the home kit tries to emulate the Umbro alternate home design from the 1986 World Cup, but the lack of any creativity is just unfortunate. The red cross on the front of the red away shirt also does nothing in terms of added creative value. England will appear in a major tournament sporting the Nike badge for the first time ever, you'd think the manufacturer would have liked to make a better impression, on the other hand I guess it's a better attempt than the one that made England look like the German squad. 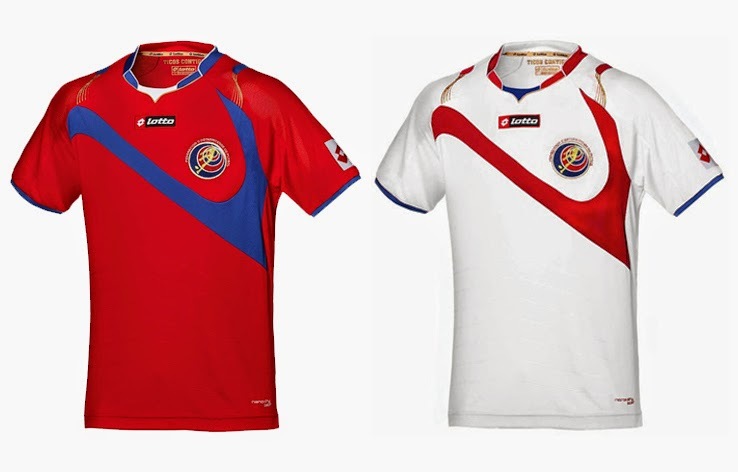 The only kit manufactured by Lotto in this year's World Cup is that of Costa Rica. Ironically enough, the detail I like best is the one that is hardest to see, that being the gold trimming near the shoulder and the wording inside the collar. I guess the collar itself is not bad either, but what in the world is that thing on the chest? Looks to me like a random shape created by a 10 year old on their first attempt at Windows' Paint program. At first glance, this cross between cycling and car-racing type of shirt seemed a bit odd, but thinking a bit more about the design made me realize that the concept makes sense. 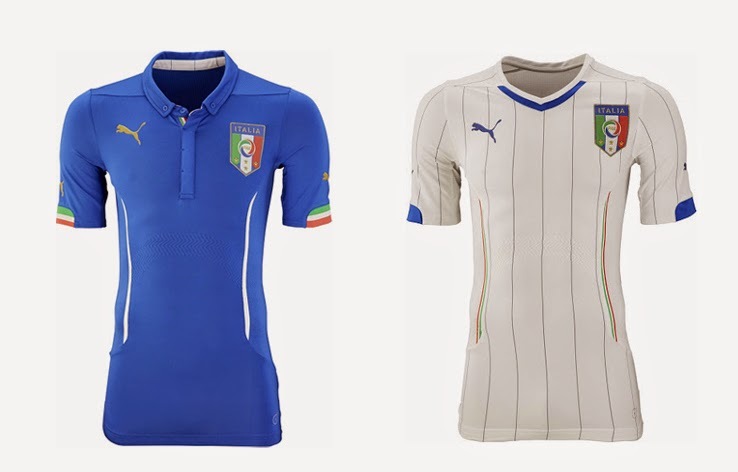 Not sure whether that was the idea in the heads of the Puma kit designers, but this style of clothing is very "Italian". The home shirt reminds me a bit of the gear you see F1 drivers wearing before and after races, while the away one I may already have seen on one of the cyclist I try to avoid every morning while I drive to work. Nonetheless, it's unique, it's tasteful and an overall solid concept from the boys and girls at Puma. A bit better than their attempt with Ivory Coast, but still bland and too similar to the ones of Chile, these kits are nothing to write home about. 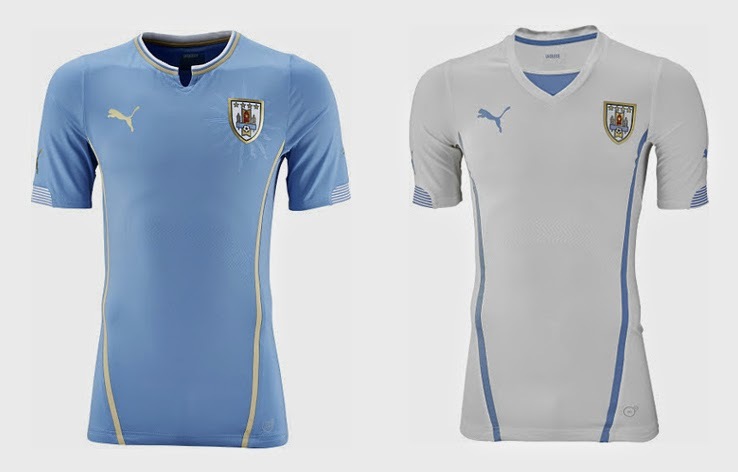 The gold trim yet again proves to be a nice touch but not enough to create a masterpiece for Uruguay.